Proper housing and diet are important factors in raising baby box turtles. You can maintain a baby box turtle habitat outside or inside, depending on space and preference, as long as the cage is at least 4 feet long by 1 foot wide by 8 to 9 inches tall. Once you have the habitat set up, it's important to pick a healthy diet of animal proteins, fruits, vegetables, leafy greens and other vegetation. If you're housing baby box turtles outside, predator-proof the enclosure. Use concrete blocks or wood all the way around the enclosure to create solid walls, and use a secure lid to prevent predators from getting into the enclosure. Place the enclosure where it will receive a few hours of sunlight for basking and get plenty of shade, too. Plant vegetation along the sides of the habitat as well as throughout the habitat. Use leaf litter and logs for hiding, sleeping and hunting. Fill a large, shallow dish with fresh water daily for soaking and drinking. Place the plate as close to level with the ground as possible so the little box turtles won't have any issues climbing into the water. If the inside of the plate is too tall, add stones to make getting out easier. Spray the enclosure to make sure that the substrate is moist, but not soaked. Try a daily spraying routine, and adjust as necessary. If you prefer to house box turtles babies inside, consider a concrete mixing tub or a 50-gallon Christmas tree storage tub. Either is easy to set up. Otherwise, you can make an enclosure with finished lumber and line it with thick plastic, like a pool liner. Use loose substrate that will hold moisture, such as finely shredded hardware mulch, loam compost, sphagnum moss or coco coir bedding. Do not use bedding that contains pesticides, perlite, manure, cedar, pine, corncob litter, play sand or alfalfa pellets. Box turtles are diurnal. They need UV lighting, so place full-spectrum fluorescent lights 18 inches above the habitat. To create a diurnal setting, set a timer to a 12- to 14-hour day. Use a heat bulb on one side of the habitat to maintain a basking spot between 85 to 88 degrees Fahrenheit. Mist the enclosure daily to maintain a humidity level of at least 50 percent. You can use a warm air humidifier or partially cover the enclosure with a lid to help hold moisture in. Box turtles, omnivores, will eat insects, some invertebrates, fruits and some other vegetation. A baby box turtle diet should be 50 percent animal proteins, 25 percent fruits and 25 percent vegetation. Feed baby box turtles daily around mid-morning after they've had a chance to warm up. Place the food on a flat dish or tile so that baby turtles will be able to easily see and get to the food. If you notice that your baby box turtles are not eating, try moving the food plate to a secluded location; many baby turtles are shy about eating. Try chopping the food into smaller pieces; large chunks can be intimidating for baby turtles -- stick with pea-size pieces. Animal proteins: night crawlers, snails, slugs, worms and crickets. Commercial turtle pellets and lowfat cat food can supplement proteins. Fruits: tomatoes, apples, melons, peaches, figs, grapes, mangoes and berries. Vegetables: green beans, peas, carrots, pumpkin, squash, bell peppers and okra. Leafy greens: endive, romaine and collard greens. Other vegetation: dandelions, leafy weeds, clovers and spineless opuntia pads. Use a calcium supplement once a week. Never offer food that may have come in contact with pesticide or herbicide spray. With proper husbandry and diet, a 2-inch-long baby box turtle will grow to be 8 to 9 inches and live 30 to 40 years in captivity. Care for juvenile and adult box turtles is similar to caring for a baby box turtle. The habitat that served your baby box turtles will suit one or two adult females. 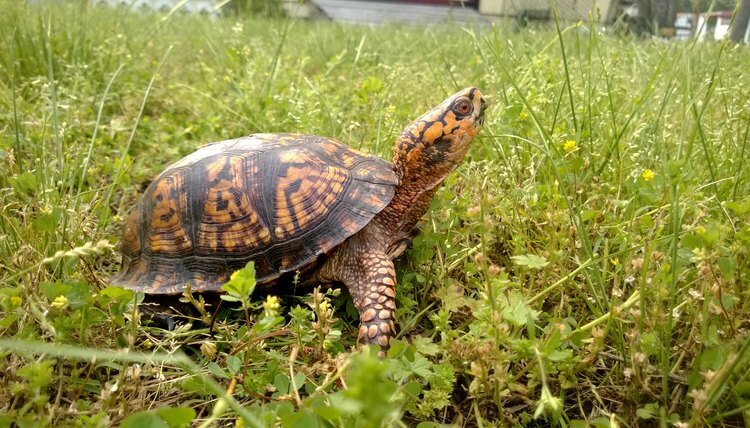 The main difference between caring for juvenile or adult box turtles and caring for baby ones is that you will reduce feedings from daily to two to three times a week during the juvenile period and after. Every box turtle is different, so when you notice your babies aren't eating as much of their daily meals, you can start alternating feedings. Avoid housing two adult male box turtles, as territorial fighting and bullying can occur.